Yeah I said it, “dumb”! This article was inspired by real life dumb interactions with recruiters. Everyone wants a great job. Millions of people are looking for work every day all day. Some companies use that competition as justification for offering subpar compensation and benefits. And some recruiters use that as an excuse to be unprofessional. I want to give you 4 ways to identify a crappy recruiter which means you should just hang up in their face!. There are too many great recruiters who really want to place candidates with the correct job to deal with bad ones. Here are some signs you should just hang-up. Dumb stuff like calling you for a screening only to tell you that you are not qualified and you need to get additional education or training. Here’s why it’s dumb. 1st of all, if an applicant is not qualified the recruiter should know that based on the resume, cover letter and LinkedIn profile; this means a smart recruiter does not call people who are not qualified. It’s a waste of everybody’s time. 2nd, why call someone only to tell them you can’t hire them? It only makes them feel worse about an already frustrating process – that’s a terrible candidate experience. Intelligent recruiters only call people that they feel they can place – period. If a recruiter calls you and says “You need to remove one of your degrees or a certification and then I can get you in the door.” You should hang up on them. Here’s why, companies complain that there are not enough skilled and talented workers to fill open positions, so why on earth would a recruiter advise someone to dumb down their credentials? And more importantly, why would you even consider it? You’ve worked hard to earn those things so don’t remove them for anybody. Another reason why it’s dumb is because if you dumb down your credentials, you are in effect lying on your resume. And if you do it and get the job, what happens when you want to apply for a promotion and it has addition requirements (which you took off your resume). Now you have to try and re-introduce those things and it looks like you will do and say anything for a job. All because a dumb recruiter gave you some bad advice. I’ve heard of dumb recruiters asking job seekers, “Do you have prison tattoos?” “Have you ever robbed anyone?” or “If I run a background, I won’t get a list of felonies, will I?” There is a way to ask sensitive questions without sounding like a dumb jerk. We all know that there are some pretty disgusting people doing some really disgusting things in the workplace. A good recruiter/screener can ask more sophisticated questions to determine if someone is a good match. Some recruiters are slick – slicker than pigs in filth. Here’s what I mean. 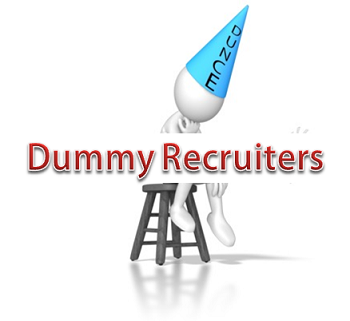 Above I illustrated how a recruiter could ask unprofessional and insensitive questions. Well there are some recruiters who are savvier. They can ask illegal questions and you don’t even realize it. For instance, “Hey how are you doing today? (that’s a legal question) Tell me about yourself, married? Kids?” Seems innocent enough, but it’s illegal. Not supposed to ask you about those things. Some employers seek married people only because supposedly married people are more stable and loyal. Some companies want employees with no kids. Kids = more time off work and less productivity. Other employers don’t want pregnant women or women who may start a family soon. Be careful answering questions about family, age and health.